Nekromantik is the one-of-a-kind classic from cult director Jörg Buttgereit. 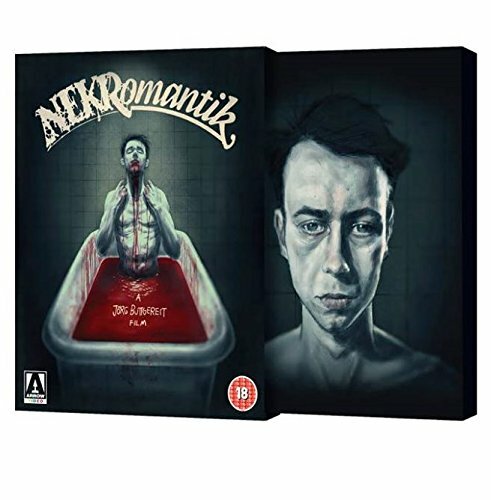 Never before released on home video in the UK, Nekromantik plunges the viewer into an unremittingly bleak world of depravity and necrophilia weaving the tale of Rob Schmadtke, a man who finds himself competing for the affections of his girlfriend with a putrefying cadaver. Exclusive Limited Edition 100-page book. Extensive image gallery including behind-the-scenes stills and the rare, surrealist German-language Nekromantik comic by Berlin artist Fil, reproduced in its entirety. 27-track CD featuring the complete Nekromantik soundtrack composed and performed by star Daktari Lorenz and musicians John Boy Walton and Hermann Kopp, plus rare tracks from Hot Love. Exclusive bound book featuring a new article on Nekromantik from critic Graham Rae, alongside pieces from writers David Kerekes, Kier-La Janisse,Linnie Blake and an archive interview with necrophile Karen Greenlee illustrated with new art and stills.